Be it any season, celebrities always have their fashion game on. For the current summer season, we are taking some outfit inspiration our favourite divas. There is nothing better than wearing stylish, comfortable dresses in summer and we got you sorted by bringing you some great dress options. 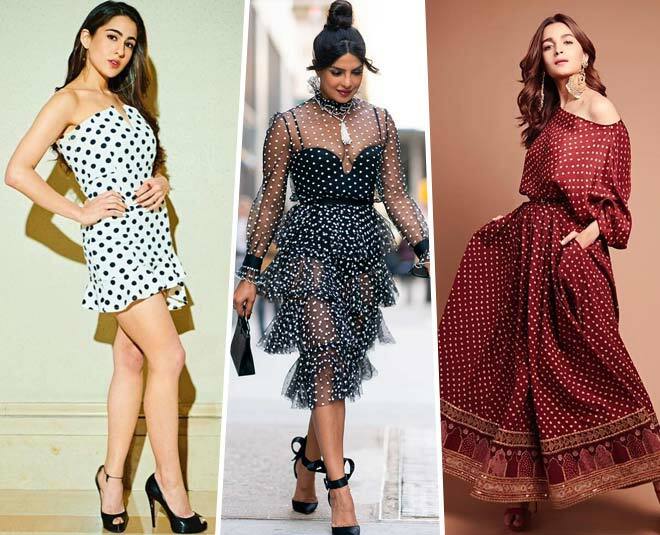 From Alia's gypsy off shoulder dress to Priyanka Chopra's black sheer dress, you have it all here. If you want to beat the heat this season in style, then read on, we have a summer style guide for you. Looks like Ananya Panday is a big fan of whites. Ananya, who is soon going to make her Bollywood debut with Student Of The Year 2 is often spotted donning white. After all white is everyone's favourite summer colour. We have been stalking Ananya for a long time now and let us tell you that the actress has a great sense of fashion. While she was on a vacay in New York, she was seen wearing a beautiful white cotton dress. The dress had a beautiful crochet detail. Summers bring along a lot of sweat and to beat the heat, Ananya's white breathable dress is a great pick. In the picture, Ananya's hair can be seen tied in a pretty side braid. Again, a great inspo for your summer hair. You can never go wrong with polka dots. This is an evergreen fabric that works for everyone. For a promotional event, Sara was spotted wearing a black and white polka dot mini dress and we think it is a great pick for the summers. The dress had an asymmetrical ruffle that added a beautiful element to the look. The dress has a summery vibe. Sara teamed this look with peep toes. What better than carrying a pretty maxi dress for a casual day out in summers? Take cues from Alia Bhatt's gypsy dress from Sabyasachi. This off shoulder dress had an ethnic touch and looked really comfortable. You want to be in the comfort zone especially during this season, this makes this one a great option. Alia paired this dress with really heavy jhumkas that added to this look. Don't Miss Alia's All-Pink Athleisure Airport Look Is Something That You Want In Your Closet RN! How about going for a sheer dress this summer? Priyanka Chopra wore this dress with a bodysuit underneath. This one is a good pick for a hot summer day when you just want your style to speak for you. Priyanka's hair was done in a high messy bun and we are definitely taking inspo for the summer hair. You can't miss on adding a beautiful floral dress to your closet for the summer season. Florals go with the vibe of the season. Take inspiration from Sonam Kapoor, the quintessential fashion queen of Bollywood. She recently uploaded a picture of herself in a pretty yellow floral dress. Yellow is such a pretty colour for the summers. You can opt for a dress like this, pair it with your ballerinas or kolhapuris and you are good to go! Which is your favourite pick from these summer dresses? Do let us know in our Facebook comments section.